Three years ago, Spokane County CEO Marshall Farnell wanted to step down. After all, he'd been working for Spokane County since the 1970s, when he joined the county as a criminal justice planner. Spokane County CEO Marshall Farnell hates photos of himself. "I’m not going to pose for a picture," he says. "I’m not a poser." 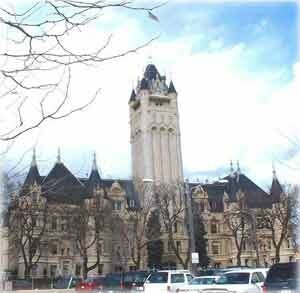 So here's a picture of the county courthouse instead. "I think I had something else in mind at that point in my life," Farnell says. "I’m a dinosaur. Looking for other things to do." He briefly alludes to one of those possibilities. "I was going to move to Italy, and work in Italy for six months on a family farm," he says, before shifting the conversation away from his personal life. Suffice it to say, those plans fell through. But he had someone else arguing fervently for him to stay: County Commissioner Todd Mielke. "We needed the stability," Mielke says. "We needed time to do some succession planning.... I didn’t sense he was ready to go yet." Mielke's efforts worked. "He did convince me," Farnell says. "He did convince me to stay. I’m not sure how he did that. I must have gotten cold feet or something." Now, Mielke is one of the top two possibilities to replace Farnell. “I think he always has had a desire to be a county executive," Farnell says. "He enjoys it. He understands it." Yet back when Mielke was trying to convince Farnell to stay, he says, any desire from Mielke to fill the CEO job never came up. "He just said, 'Geez, why are you leaving?'" Farnell says. "If you’re happy and you’re content and you enjoy what you’re doing, why don’t you stay another year?" Three years later, Farnell's finally leaving this summer. "It’s just time to move on. To take on some more challenges," he says. He wants to go skiing some more, maybe spend some time in Jackson Hole. Looking back, he's particularly proud of the construction of the Spokane Arena, the expansion of the convention center, and the recruitment of companies like Caterpillar and BF Goodrich to the county. "Those projects that we did together, that were community-wide, had huge impacts," he says. "Those were the projects that have been the most rewarding." And then there were the difficult, complicated projects, like the building the Waste to Energy Plant or bringing sewer lines to Spokane Valley. "The valley sewer project was very tough because there was so much opposition to it," Farnell says. "But we protected the aquifer." Much of his job consisted of presenting a variety of options to the county commissioners. With a county budget racked by annexation and incorporation, balancing that budget has been a constant challenge. "We have not given a [cost-of-living increase] for five years for our employees," Farnell says. But Mielke says Farnell's done an admirable job at helping the county navigate those rocky waters. "One of the first obligations of any good governmental entity is you have to be financially sound," Mielke says. "Spokane County’s success — we're not on the watch-list for insolvency — is because Marshall has pushed us really hard to play the game over the long haul... Don’t spend one-time money on ongoing programs. When the economy turns on you, make your adjustment right away." Mielke knows he'll have to take a more backseat, advisory role than he played on the Board of County Commissioners if he replaces Farnell. "You don’t see him quoted in the paper a lot. You don’t see him the spotlight and the limelight." Mielke says. "He’s kind of the the quiet coach on the sidelines — 'here’s how you’re going to improve your game.'" Asked for any advice for his successor, Farnell focuses on ethics. "Always tell the truth. Although sometimes telling the truth is hard to do," Farnell says. "Pigs get fat, hogs get slaughtered." "People in these positions have a lot of leeway. Sometimes people take advantage of those," he says. He alludes to the news that Rep. Susan Fagan had resigned after inflating mileage and expense reports. "They’re the fat pigs that get slaughtered." Are Spokane detectives on the trail of a serial killer?